Welcome to The Abso!ute Sound online! We explore music and the reproduction of music in the home. We believe that the sound of music, unamplified, occurring in a real space is a philosophic absolute against which we may judge the performance of devices designed to reproduce music. Our goal is to provide the resources consumers need to judge how a component's sound either honors or departs from the music's truth, and to make sound purchasing decisions that maximize their experience of reproduced sound. Below is our Issue 178, January 2008 contents and editorial. Wilson’s flagship X-2 Alexandria undergoes a major upgrade; Olive and MusicGiants team up to deliver lossless DRM-free music; Seattle’s Definitive Audio hosts the third annual Music Matters extravaganza. Wayne Garcia listens to NHT’s $600 Classic Two loudspeaker and Vincent’s $799 integrated amplifier. Neil Gadner evaluates high-end headphones from Grado, along with two headphone amplifiers. Also, Robert Harley reports on B&W's Zeppelin iPod speaker system. Chris Martens on the Definitive Technology Mythos ST, a multichannel speaker system equally at home with music or movies. 44 Digital Signal Processing and the Future of Audio Technology Robert E. Greene explains why digital signal processing is destined to be in our audio future. 52TAS interview: Keith Jarrett The great pianist talks about the new release of old recordings, musical expression, sound quality, and his impact on the world of music. Active Speaker Arnie Williams on a powered mini-monitor for the desktop. Preamplifier This $1880 tubed preamp is a whole different kettle of fish, says Sue Kraft. Equalizer REG on a sophisticated new DSP room-correction system. Ill Signature The latest amplifier from the pioneer in Class D amplification lives up to its name, NG reports. Mini-Monitor Jonathan Valin on a beautiful-sounding two-way from Denmark. Robert Harley reports on a tour-de-force in loudspeaker design. 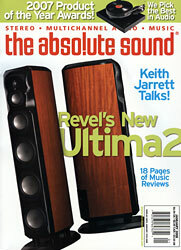 Loudspeaker Neil Gader on the versatile little brother of Revel’s Ultima Salon2, the Ultima Gem2. 133 TAS Interview: Kevin Voecks RH talks to Revel’s head man. HP on an $7900 loudspeaker that pushes all his buttons; an improved version of the Lab/47 Pi Tracer CD player; the Lumen White Silverflame loudspeaker; and the Sequerra Metronome MET 7.7 mini-monitors. Harmonia Mundi’s Fiftieth Anniversary Boxed Set. Vadim Repin and Martha Argerich play Beethoven’s "Kreutzer" Sonata, Richard Egarr tackles Bach’s We//-Tempered Clavier, Järvi takes on Beethoven symphonies, IKancheli’s Styx and Tavener’s The Mjrrh-Bearer, Danielle de Niese sings several Handel arias, Preisner’s Silence, Night & Dreams, Haitink conducts Bruckner’s Symphony No. 7, and a smattering of Mahler SACDs. Reviews of new CDs and LPs from Serj Tankian, Radiohead, the Fiery Furnaces, LCD Soundsystem, Six Organs of Admittance, Band of Horses, Bruce Springsteen, Joni Mitchell, Annie Lennox, Youssou N’Dour, Opeth, Nappy Brown, Kid Rock, and Dwight Yoakam. Plus, collections from Bob Dylan and Luther Vandross, Rhino’s Joy Division reissues, James Taylor on audiophile vinyl, and the verdict on Universal Japan’s LPs. Coverage of hot releases from McCoy Tyner, Blue Chamber Quartet, Meshell Ndegeocello, and Queen Latifah. And, new box sets from Frank Sinatra, Billie Holiday, and John Coltrane, and a 180-gram LP from Dexter Gordon. 192 We talk with Sandy Gross, President Emeritus of Definitive Technology.